Mother 2 – known in the West as Earthbound – was arguably one of the most unique RPGs to emerge from the fourth generation of game consoles. Eschewing the well-trodden swords and sorcery theme of games such as Final Fantasy, Earthbound was about the adventures of a group of children in the modern age. Additionally, it featured an interesting rolling health system wherein a killing blow from an enemy could be survived if they could be defeated before the player's health ran out. Rather mysteriously, a never before seen copy of the Super Famicom edition of Earthbound recently popped up on a Yahoo forum in Japan. The owner of the cartridge wanted to know what it was and there still isn't a definitive answer. Fans speculate that it's a demo cartridge of some sort or perhaps a competition version of the game, but this is still very much a mystery. Hopefully, the owner can get their hands on a Super Famicom soon so an answer can be found. What do you think it is? Do you recognize this cartridge? Drop us a comment in the section below. "Eschewing the well-trodden swords and sorcery theme of games such as Final Fantasy,"
I feel Dragon Quest would've been a better comparison. I can't see it being a competition cartridge. Prototype or demo maybe. @DarthNocturnal Wasn't VI the first one that changed it up? @DarthNocturnal Fair enough. I've never played any Dragon Quest games, I've been meaning to for awhile now. What makes them different from FF? @MitchVogel You have the menu that work like Earthbound and you can set an AI for your other characters. The combat show only the monsters facing you like Earthbound instead of side sprites showing the heroes at the same time. DQ is less story heavy than Final Fantasy, it's more gameplay driven. Well, from what I've observed, Dragon Quest has retained the turn based battle system from game 1, whereas FF keeps trying to mix things up (with mixed results). Very rooted in traditions... some might even say to a fault. My original statement stems from the fact that Mother / Earthbound is a Dragon Quest "clone" (used in the most positive manner possible). It was a fairly common thing (not surprising, given the popularity of DQ in Japan). Another notable example is the Glory of Heracles series. It took the Dragon Quest formula, and applied a Greek mythos setting. Is the only difference on the cart that the label is slightly lower? @EonCow Super Famicom carts have a horizontal indent in the middle of the cart, while this one does not. 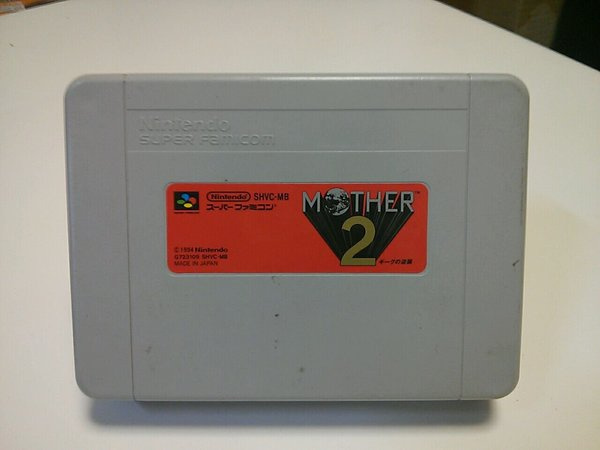 @Megumi I came across an interesting Mother 2 cartridge, and when I played it...SPOOPY STUFF HAPPENED! I was the former owner of the cartridge. What makes them think it isn't just a Mother 2 cartridge? Comic Book Guy: Alternative ending?!? Chewbaca is Luke's father!!!! Beta/prototype cart maybe? The safest guess would probably be it's a bootleg cart. It would be hilarious if it was for the Nintendo Playstation that was found this year. @joep1984 This cart actually looks more like a US SNES cart than a SFC cart, and that says a lot because it looks nothing like a US SNES cart. Anyone asking what's different about the cart: because it looks more like the Nintendo Powerfest '94 carts, which were T-shaped (with the pin connector on the bottom, and a flat top that spreads across the top of the console). @Chaoz I was thinking the same thing. I even researched common features of bootlegged GBA games and discovered at least one of my carts was 100% fake. I became suspicious after my saves were commonly corrupted.